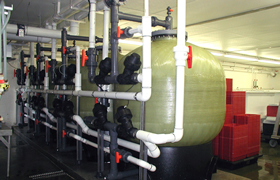 Aquaculture Seawater Filtration Systems, Northwest Water Treatment, Kent / Seattle. Successful aquaculture relies on consistent water quality to maintain or increase survival rates. In an aquaculture farming environment, without adequate filtration natural seawater changes can have devastating consequences: inability to fill orders, lost revenue, even lost customers. Inadequate filtration medium, including swimming pool filters, put more than just your harvest at risk - they can put the future of your company at risk. Careful analysis and a tested system can eliminate the risks of seawater quality fluctuations so you can focus on the continued success and growth of your company. Northwest Water Treatment, Inc. has installed successful aquaculture filtration systems for major universities and commercial shellfish hatcheries across the United States. We typically use filter systems consisting of sand, sand/anthracite, or an efficient mixed media bed which allows for high flow rates and provides excellent filtration. Our extensive aquaculture filtration experience gives us unique breadth and depth of experience and an excellent track record of success. Our proven-successful process saves time, saves money, and ensures your seawater quality issues are cost-effectively resolved. During your on-site evaluation your aquaculture water filtration specialist will thoroughly review your entire system. In addition, they will discuss the technical requirements of your system ensure a thorough understanding of your requirements and any potential concerns. When your system design is finalized, you will receive a fixed-fee quote via email which includes professional installation, high-quality equipment, filtration, plumbing, parts, materials, system start-up, verification, and training. On your approval of your quote we will schedule your seawater filtration system installation. Assemble and install your complete filtration system at your location, verify your system, then train you to perform routine maintenance. Contact us to request an on-site water analysis or to get answers your questions about seawater filtration systems for aquaculture. "I have been working with Glenn Karn of Northwest Water Treatment since 1994 on filtration systems for shellfish hatcheries. He has set up a number of filter systems for clients of mine at many sites around the country and has always delivered a superior system in a timely manner. His knowledge, commissioning, and support are second to none." © Copyright 2011 - , Northwest Water Treatment, Inc. - All rights reserved.Website Design, Hosting and Maintenance by New Tech Web, Inc.